(March 20, 2017) Two successful Safe Routes to School open houses are complete, but there are seven more to go! We look forward to seeing YOU at your high school cluster open house. We need to hear from you how to spend $8 million on safety projects near schools. Through the Portland Bureau of Transportation’s Fixing Our Streets program, Safe Routes to School is expecting to make a large investment in safety improvements around Portland schools in the next few years. This spring we're asking families to help us figure out what is needed most in your high school cluster. 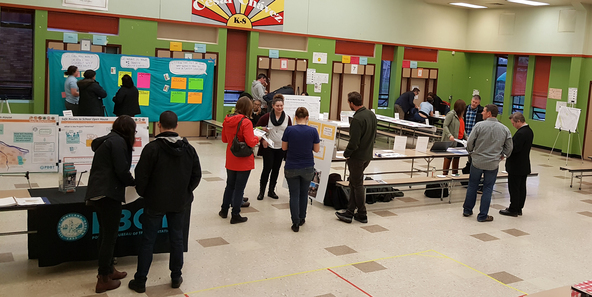 The Safe Routes to School program is hosting open house events across the city to listen to families about their routes to school and the barriers they face. At the most recent events, families from the Grant and Roosevelt High School clusters talked about speeding drivers, difficult crossings and arrival/dismissal traffic concerns. 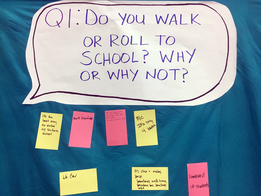 While at the open house, parents expressed why they walked or rolled...or didn't; what was their number one safety concern; and how far they would go out of their way for a safer crossing. They also drew their routes on school maps and learned just how much it costs to create their perfect intersection. Portland Public Schools was also there to share information about their www.SafeRoutesPDX.org web app that lets families share their safety concerns online. We were also thrilled to have our friends from the organization Oregon Walks at the open house to invite families to join their upcoming community walks. Visit www.oregonwalks.org to see the schedule. If your student attends a Portland Public or Parkrose school, we are hosting open house events (see the schedule below). If you are not sure which high school cluster contains your school, check our list here. The Portland Bureau of Transportation will invest this money in a wide variety of street improvement and safety projects across the entire city. Fixing Our Streets will help PBOT expand preventive street maintenance that saves money and prevents potholes. It will support our work to make it safer for children to walk to school. It will allow us to build more sidewalks, traffic signals, street lights and bike lanes. In approving Measure 26-173, voters also voted for a transparent, accountable and efficient program. Click through each section to learn more about the projects included in this program - or visit the Fixing Our Streets interactive map. Questions or comments about Fixing Our Streets may be submitted to: fixingourstreets@portlandoregon.gov.